White has been a popular cabinet colour choice for a few years now and remains popular in 2018. People are attracted to it’s clean look and its ability to make smaller rooms feel larger. White goes with anything and nowadays, homeowners are choosing to break up the all-white kitchen with bold splashes of colour. Consider a wood stained island, bright tile for the backsplash, eye-catching hardware or even a bold colour for other accent pieces in the room. Either a subtle and light shade or one that is almost-black, grey is appearing in more kitchens this year. Painting your cabinets grey can give your kitchen a modern look and the colour is quite versatile. You can have grey cabinets with natural countertops, bright coloured accents or just on their own and they’ll still look sleek, elegant and stylish. Check out these gorgeous grey cabinet paint colours. Kitchen cabinets have typically been neutral or natural colours over the years, but colour is making its way back into the kitchen! Green, in a variety of shades and hues, is becoming a popular design trend. Green can be both warm and cool and is always inviting. With so many shades available, can match nearly every design scheme. Choose from sage, teal, mint and even lime green when you’re cabinet painting. A growing trend over the past view years has been white or a neutral tone cabinet on the top with a bright or bolder colour on the bottom cabinetry (or vise versa). 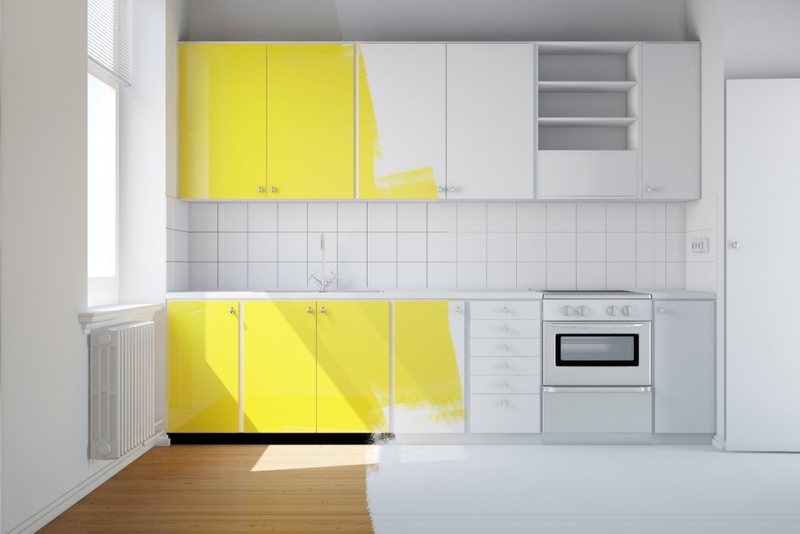 Homeowners are taking it a step further by having two different colours in the kitchen. Perhaps a dark teal below and yellow cabinets above, or a subtle blue above with wood grain cabinets below? If you are planning on selling your home anytime soon, don’t get too carried away with your kitchen’s colour scheme. Remember that neutral is best when presenting the room to buyers. Need some how-to tips or inspiration? Read more articles about cabinet refinishing.